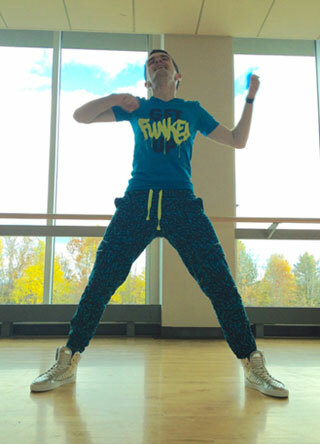 The UNB Queen Elizabeth II scholarship program has teamed up with URec to host the “biggest Zumba class ever” on Friday, April 1, in the Alberta Alumni Recreation Gymnasium at the Richard J. CURRIE CENTER. The Zumba class will begin at 12:10 pm and all members of the UNB and Fredericton community are invited to participate. No membership is required; admission is by donation. Donations will go to helping the UNB 2016-2017 Queen Elizabeth II scholars purchase medical supplies for our partners in Malawi. The target of the organizers is to raise around $2,500 and invite around 100 participants. “Zumba is a fun, interactive and popular kind of class that allows people to have a lot of fun while they are working out. You don’t need any skill or special equipment to participate – just a willingness to let go and dance the time away,” said Alina Cress, program coordinator at URec. The Canadian Queen Elizabeth II Diamond Jubilee Scholarships program is an integral part of UNB's international internship program and provides an opportunity for Canadian and international students to participate in local, national and global development challenges faced by all Commonwealth countries. Eleven of the 18 scholars from UNB will be going to Malawi, one of Africa’s poorest countries with many rural communities in need of critical health care services. Many of those students are focused on increasing their experience and knowledge related to health care, nutrition, clean water, community development and access to a doctor. It is hoped that the funds raised will enable the students to purchase four medical kits from Health Partners International Canada. Each kit is valued at $575 and designed to assist doctors in providing health care to approximately 600 people. “It is our objective to raise enough money to enable our partners at the Kauma Village Medical Services, Kamuzu College of Nursing and the African University of Guidance Counselling and Youth Development to provide health care services for up to 3,000 people (boys, girls, men and women) who may not have had access without these supplies,” said Veronica McGinn, International Initiatives, Internships & Programs at UNB.